During a recent business trip to Hong Kong, Lindi and I got the oppurtunity to get some time to roam around the streets of Hong Kong. There are some amazing contrasts between the big brand high fashion shops on the main street, then in the alley ways just off those same streets you get a glimpse of real Hong Kong life. 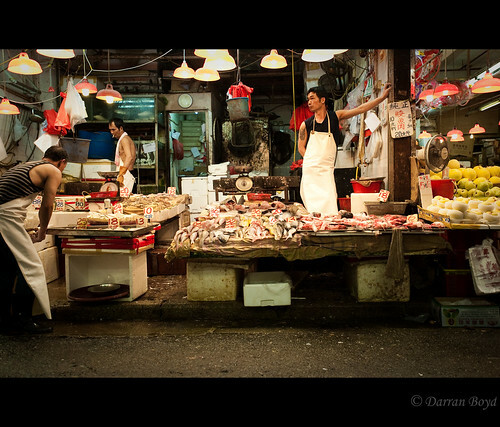 This is one of the many meat, poultry and fish market stalls we came across. It was crowded with people, so it took some patience to wait for a gap in the human traffic to grab a shot of this scene. For the geeks: Nikon D700 with 17-35 f2.8. Taken at 35mm F2.8 1/400, ISO1600. Looking at this now I could have gone for 1/200 and lowed the ISO. This was handheld with available light. I’m so impressed with the low light capabilities of the D700, this was taken after 6pm on a very wet and overcast day. Thanks for the info. Nice shot!